frillip moolog - Blog :: frillip moolog blog: Fighting to build, fighting to save. Zaha Hadid at Vitra & John Madin in Birmingham. Fighting to build, fighting to save. Zaha Hadid at Vitra & John Madin in Birmingham. Just a couple of weeks ago I made an exciting trip to Basel, Switzerland. Not only was I delivering "Bettina" to her new home but the trip was also great opportunity to see some inspirational architecture. 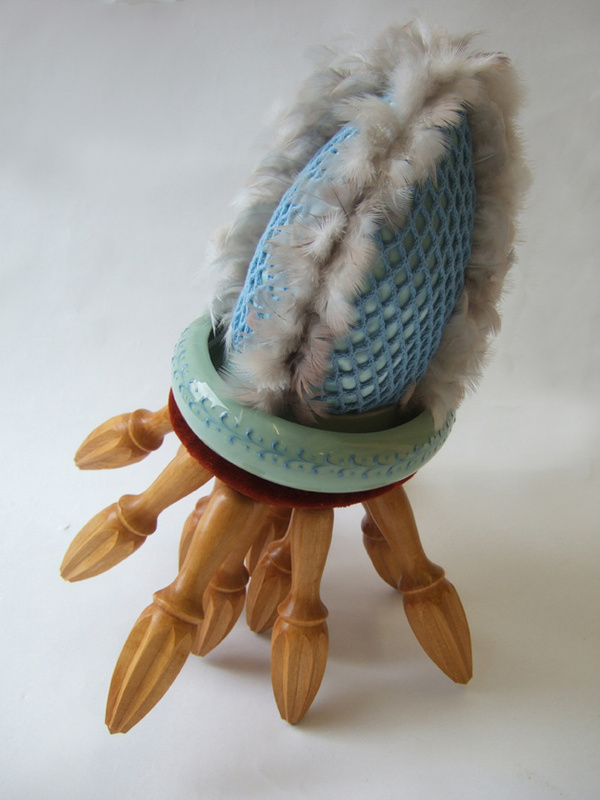 Back in 2007 I contacted curators at the Vitra Design Museum when I was researching Mary Little. They have one of her chairs in their renowned furniture collection. This year while in Basel it was an easy journey to Weil am Rhein to visit the museum. In 1981 there was a serious fire on the Vitra manufacturing site. But every cloud has a silver lining and for architecture lovers the reward has been that the company directors decided to give architectural commissions to world class architects. They decided to make a serious statement and to use architecture to “imbue the site with vitality and a distinctive identity”. This ambition is really paying off as now 20 years later the name Vitra is even more synonymous with forward thinking design and adventurous spirit. The Vitra museum is a Mecca for architecture lovers and there are three architecture tours each day. As provenance would have it although the museum had more than a hundred students visiting on the day of my visit I was the ONLY person on my tour. 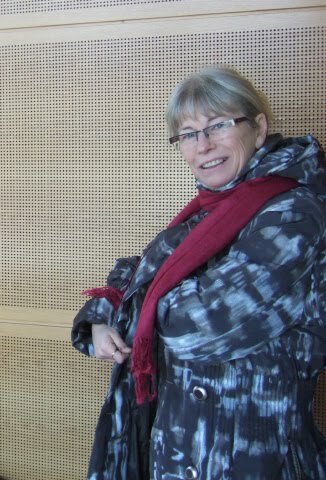 I had my own personal guide (Muriel Cappelaere). One of the stories that Muriel told me was the one behind Zaha Hadid’s Fire Station commission. Although possibly a myth I feel that the story is worth repeating. Apparently Hadid had actually visited Vitra with proposals for a chair design. These were turned down but back in her hotel room after the meeting Zaha Hadid (an ambitious and driven women who believes in her worth) drew up some initial sketches for a fire station. A beautiful and useful piece of architecture….. I love this story because it’s a great example of how rejection can be the catalyst for a lot of creative energy. To realise ambition you need energy and lots of ideas. Necessity is the mother of invention…. Zaha Hadid has had to fight extremely hard to have her designs accepted. A prime example of this was her experience of winning the competition to design the Cardiff Bay Opera House (1994) only to have it rejected by the people of Cardiff. A second competition was run which Hadid entered and yet again she won the competition but again failed to overcome the opposition of the public. The project was abandoned by the Millennium Commission. She is a fantastic example of someone who will push and push to succeed. She hasn’t dumbed down her designs but she has had to learn the politics of how to get her work built. She has ambition and she believes in her work. She is definitely the sort of person to take inspiration from. So Zaha Hadid has had to fight to have her buildings built. But imagine how much worse it must be to have been a successful architect; to have had hundreds of buildings commissioned all over the world for now in your 80’s to have to fight to save them from the bulldozer? This is the situation that John Madin, architect of many public buildings in Birmingham now finds himself in. I moved to Birmingham from Edinburgh back in 1984. Birmingham is my adopted city and I am really quite proud of it. BUT I am so sad and so disappointed that the city planners can’t keep just one piece of Brutalist architecture. They have already demolished two of Madin’s Birmingham buildings the Post and Mail building and BBC Pebble Mill Studios. Now they are going for the Central Library. Like Marmite you either love the building or you hate it. Unlike Prince Charles I happen to love it and have done so ever since I first saw it back in 1984. I have zig-zagged up the narrow escalators; to study, to research, to read and to use the (yes now scruffy toilets). I have enjoyed soaking up the atmosphere. Even Alan Yentob had to admit that the space is full of light and really quite enchantingly atmospheric. Not his exact words but he said something similar, before deciding that it still should go! (BBC documentary 2008/2009). Like Olivier Ruellet I too am an artist who is, “concerned with the emotions brought about by memories and the experience of places” and am also fascinated by the "wanderings of our minds". Olivier Ruellet talks of inner journeys or ‘in-scapes’ I talk of the ‘place’ I have named “Frillip Moolog”. But isn’t the fact that it was the first post war civic building to be built from concrete not enough to save it?…sadly not. 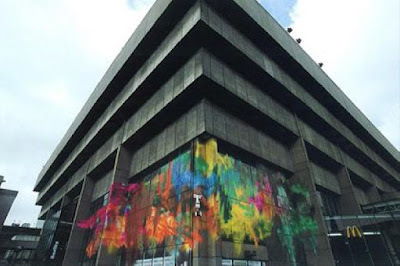 Now, in his 86th year, celebrated architect John Madin will have to watch as his Birmingham Central Library building is destroyed. On 29th November 2009 Culture Minister Margaret Hodges announced her decision to overrule English Heritage’s proposal that the library should be awarded Listed Building status. Having fought so hard to have her designs built, what lengths would Zaha Hadid go to to save one of her own buildings from the bulldozer? How would she react if, within her lifetime, they are deemed of less importance than a city’s redevelopment plan? Although Madin’s design for the Central Library was never fully realised the building has inspired many artists. Michelle Lord and Katharina Grosse being just two. Above image from Ikon Gallery website. 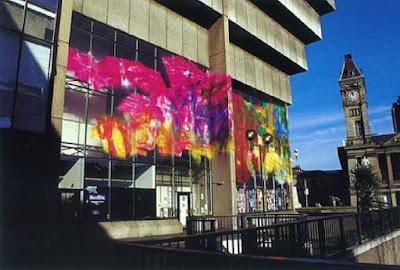 Katharina Grosse painting on Birmingham Library building 2002. The National Theatre on London's Southbank is one of Britain's most famous Brutalist buildings. The Queen Elizabeth Hall is also part of the Southbank Centre and here the council have taken an enlightened approach to buildings and how we interact and use them decades after they have been built. By giving permission to Graffiti Artists and skateboarders to use the Queen Elizabeth Hall on London’s Southbank as a canvas then they have helped to pass on ownership of the space below the building to future generations. I wonder if Zaha Hadid could tolerate these forms of artist interaction on any of her buildings?